You’ve probably noticed that we at Inhabitat are super excited for the commercial release of the Chevy Volt in the US. Well it turns out that General Motors has another extended range electric Volt model under their belt! Tomorrow at the Beijing Auto Show GM will reveal the Chevy Volt MPV5 — a larger version of the Volt Sedan that seats five and has an amazing amount of cargo space in the rear. Could this be the eco-soccer mom’s ride of the future? This new concept car runs on the same engine as the Chevy Volt, although because of its larger size it has an estimated all-electric range of 35 miles — instead of the volt’s 40 miles. After the battery has been depleted a small gas generator sustains the battery charge for an extra 300 miles. The new Volt MPV5 even borrows some design elements from its smaller sister — from the dashboard to the tail lights they’ve got the same streamlined, efficient style. However this larger car will reach a whole new group of people with the need for roomier vehicles. With 30 cubic feet of space behind the second row of seats and 63 cubic feet of space with the seats folded, this crossover vehicle could haul a lot of mulch to your garden on it’s clean electric charge. Though the vehicle is still a concept, we’d love to see this green machine zipping along the highways. Great information. Your blog has become one of my daily websites to visit. I was never, in any way, a Chevy fan before the Volt. Now with Toyota screwing up the interior of the Prius and Ford hooking up with MediocreSoftware (a.k.a. Microsoft) my attention for the first time in my life has been towards Chevy. My wife is totally stunned. I don't blame her. I'm was really anti-Chevy in the past. Probably something to do with my dad buying Fords growing up. You’ve probably noticed that we at Inhabitat are super excited for the commercial release of the Chevy Volt in the US. You've probably noticed that we at Inhabitat are super excited for the commercial release of the Chevy Volt in the US. Well it turns out that General Motors has another extended range electric Volt model under their belt! Tomorrow at the Beijing Auto Show GM will reveal the Chevy Volt MPV5 -- a larger version of the Volt Sedan that seats five and has an amazing amount of cargo space in the rear. Could this be the eco-soccer mom's ride of the future? 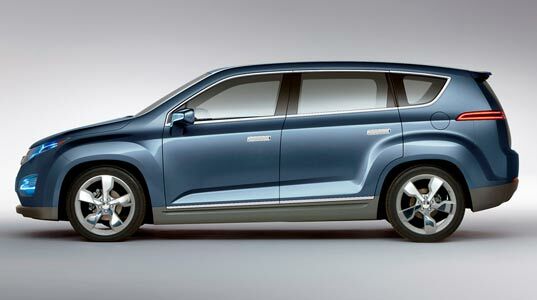 Well it turns out that General Motors has another all electric model under their belt. Tomorrow at the Beijing Auto Show GM will reveal the Chevy Volt MPV5. It is a larger version of the Volt Sedan that seats five and has an amazing amount of cargo space in the rear. Could this be the eco-soccer mom’s ride of the future? Though the vehicle is still a concept, we’re hoping that General Motors sets this one on the list of vehicles to produce. We’d love to see this green machine zipping along the highways in our towns.